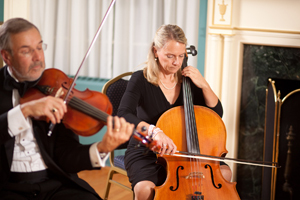 Welcome to the website of the Maxwell String Ensemble! We are dedicated to making beautiful music for your Rochester/Finger Lakes NY wedding ceremony/cocktail hour/dinner/social event/holiday party an easy and enjoyable choice! 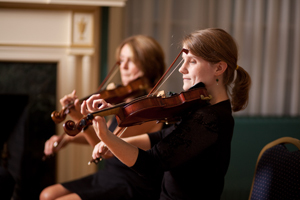 We offer flexible ensembles for every budget & need... string quartet (2 violins/viola/'cello,) string trio (violin/viola/'cello,) & violin/'cello duo...and trumpet can be added to the trio or quartet for extra flourish in wedding ceremony music. Our members are all music educators in Rochester NY-area school districts, as well as dedicated professional musicians in Rochester & Finger Lakes NY music ensembles...we can be found in the Penfield Symphony Orchestra, Cordancia Chamber Orchestra, Finger Lakes Choral Festival, Genesee Valley Orchestra and Chorus, the orchestras of area musical theatre productions and more.